Ikpeazu Tax Clearance not Fake! – Abia IRS Breaks Silence. The Abia State Internal Revenue Service has reacted to the alleged fake tax clearance certificate the state governor, Okezie Ikpeazu, reportedly presented during the state’s PDP governorship primaries in 2014. According to a statement released by the state’s internal revenue service this morning, the tax certificates of Ikpeazu are not fake and were duly issued by them. See Abia IRS official statement after the cut . . .
primaries, Uche Sampson Ogar, proved to the court that Ikpeazu tendered fake tax credentials to their party. Read full text of the statement released by the Abia state internal revenue and signed by its chairman, Udochukwu G.
1. That the tax clearance certificate referred to in that Judgment was duly issued to Dr. Okezie Victor Ikpeazu by the Service, and was therefore not fake. suggest that they were paid on those dates, but only reflected the date he applied to be issued with the receipts, because that was when he needed them. 4. In the same vein the dates on the tax receipts did not suggest that they were written out on those days. The date on the receipts only indicates the last day of the last month of the year, when the PAYEE tax payer became entitled to the receipts, as the receipts could not have carried a date earlier or later than the 31st December of the relevant tax year. It is immaterial that it fell on a Saturday, Sunday or any other day of the week. For example if 31st December 2011 fell on a Saturday, in the month following i.e January, when the receipts are to be written out, it cannot carry any date in January 2012 or any other month in 2012.
when due. In fact the issue of payment as at when due does not apply to PAYEE taxes because the tax payer has no part to play in the deduction and remittance of his PAYE as the same is done by his employer. Where there is failure to deduct and remit PAYE taxes, it is the employer and not the tax payer that is liable. See LSIRS and Seven Up Bottling Company reported in year 2000. Having stated the facts as they are above, we make bold to say that the tax returns filed by Dr. Okezie Victor Ikpeazu to his party (Peoples Democratic Party) were neither false nor fake and cannot be said to amount to fraudulent payment of taxes. empowered by law to do so. 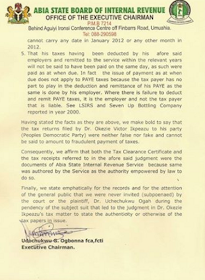 Finally, we state emphatically for the records and for the attention of the general public that we were never invited (subpoenaed) by the court or the plaintiff, Dr.
Uchechukwu Ogah during the pendency of the subject suit that led to the judgment in Dr. Okezie Ikpeazu’s tax matter to state the authenticity or otherwise of the tax papers in issue. ALSO SEE: THE REASON WHY MAN CITY WITHDREW IHEANACHO FROM OLYMPICS WILL SHOCK YOU!